One of the first records we have of him playing was in an FA Cup first round replay on Thursday 16th January 1908 in which Swindon Town beat Sheffield United after extra time. What has kept the memory of this match alive is not that Swindon won, but that they were in the Southern League at the time, and apparently hadn’t won a game in the FA Cup proper for 20 years. The first match was drawn in Swindon and the replay was heralded as one of the David and Goliath matches. Although the list of games takes us away from Lievesley as such it is interesting in its own right, because of the regularity of the matches, and the fact that there must have been some transport problems at the time. At Woolwich Arsenal and The Arsenal his career spanned just two seasons, cut off (as so many careers were) by the first world war. He had come into the team as a replacement for McDonald (who finally left in November 1913) and made 75 appearances in goal. And that’s about it. Obviously a man of repute and ability, but I regret I have nothing more on him. The Staveley that he was born in was the one near Chesterfield. He also played for the Football League v The Southern League on 11 April 1910 score: 2-2. He retired from playing in 1916 due to an arm injury. His last game for Arsenal was the last game of the 1914-15 season. Here’s a picture of him from the 1914/15 handbook. Two of his sons played league football. Leslie played 277 league games for Doncaster, Man Utd, Chesterfield, Torquay and Crystal Palace before his career was cut short by the second world war. Harold managed just 1 league appearance for Doncaster in 1934/35. OK Andy you are clearly on fire at the moment. Here’s another one. I have been corresponding with one or two people at Arsenal about the celebrations of 125 years next season and the re-introduction of “Forward Arsenal” as a slogan. When was the first time this was used? You’ve got me there Tony. The only time I’ve come across the two words together is Bernard Joy’s book of the same name. joe lievesley was my grandad my father horace was also a very good footballer as was dennis lievesley for aldershot.harold lievesley died from tb at the age of 22.i have alot of memrobelia about their careers including things from grandads tour . I can confirm that he was born in Staveley in Derbyshire though after he stopped playing he moved to Rossington near Doncaster. 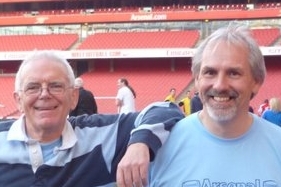 As well as footballing sons, Joe also had two footballing brothers, Wilf (my father) who played for Manchester United and Exeter and Ernest Frederick (Fred) who played for Manchester City and Rotherham. Concerning the 1910 tour to South Africa,I am trying to find information concerning scorers and attendances for all 23 matches. I would appreciate your help if you can assist me. Also – if you have any match programmes/teamsheets you are prepared to part with then please get in touch. I’am looking into my family tree, my grandfather was Douglas Lievesley (worksop/Creswell)he once spoke of Joe Lievesley as a family member.Any information on Joes parents would be appreciated. He has been celebrated here as he played in the last ever Woolwich Arsenal game. Do read the comments after the article, as there is more information there as well. What’s more we also have on this site an “Ancestors” section so if you could write up a piece for that we would be very grateful. Hi Gillian,I have just found this post! I’m writing a book on Charles Bell who was on Arsenals books 1913/14. He only played once with Joe ( away to Leic Fosse) the rest of the season spent in the reserves. I wondered if he was mentioned in your memorabilia? Or a photo? I’ve never seen a squad photo for this season. Also if you are interested I have some nice stuff on Les from the Benfica game in 1949. 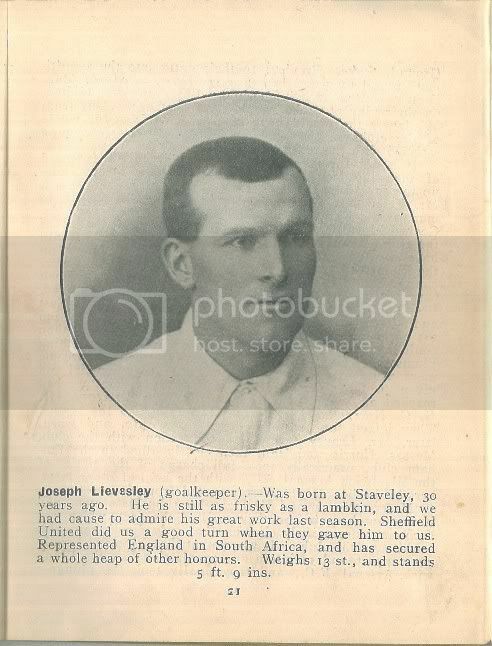 I have just read that Joe Lievesley, the former Sheffield United goalkeeper died on 20th May 1922 at Staveley. Has the article got the wrong man as most publications say he died in 1941. Ian it is always possible I’ve got the wrong one; it has been known, especially as for some of these players the information is quite sketchy. But in this case I think we’re right, and what we have got does coincide with Wikipedia – which I have found to be wrong on some occasions. Perhaps more to the point is that in the correspondence on this player Andy Kelly added more details but didn’t say that anything was amiss with the report, and Andy is known for his detailed examination of everything concerning Arsenal players so I suspect we are on the right track. Hi just seen this if you want info email me might have what youre looking for realise by now you might already have it. A very interesting article on the BBC sports news website today detailing the Torino Football Club’s tragic air crash in 1949. Joe Lievesley’s son was the trainer to the Italian champions and was killed along with the entire team. His son, Joe’s grandson, is now 80 years old and interviewed by Patrick Jennings and in the aftermath of the disaster as a young boy had to come back to England to live. He went back for the first time only ten years ago to pay his respects at the site of the tragedy and it is a truly touching piece.